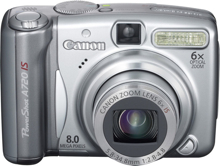 The Canon PowerShot A720 IS an 8 megapixel point and shoot camera featuring a 6x optical zoom lens (equivalent of 35 to 210mm). It features optical image stabilization, an ISO range of 80 – 1600 and a 2.5 inch LCD screen and optical view finder. The Canon PowerShot A720 IS has aperture and shutter priority modes, manual mode as well as 12 scene modes. The camera measures 97 x 67 x 49 mm (3.8 x 2.6 x 1.9 in), weighs 250 g (8.8 oz), and running on AA (2) batteries. CNET reviews the Canon PowerShot A720 IS and writes – "Surprisingly broad depth-of-field and solid white balance contribute to the camera’s excellent picture quality. Both small text and fine textures appear crisp and full of detail, even when stretching across multiple planes. Slight fringing appeared on off-white and yellow edges, though not to the point that the photos suffered. In general, if you stick to ISO 400 or lower, the A720 IS will produce great pictures." Trusted Reviews reviews the Canon PowerShot A720 IS and writes, "The A720 IS is clearly aimed at photographers who expect a bit more from their camera than a simple point-and-shoot snapshot can provide, and this naturally includes superior image quality. 8MP is about the optimum resolution for compact camera image quality at the moment, and the A720 performs better than most. The 6x zoom lens is particularly good, providing a huge amount of fine detail with good edge sharpness and very little barrel distortion at wide angle, although there is a little pincushion distortion at the telephoto end. Dynamic range is very good considering the small 1/2.5-inch sensor, with excellent shadow and highlight detail even in very high contrast shots, and colour reproduction is typically superb. Noise control is also well above average, with very good image quality at 800 ISO, and usable results even at the maximum setting of 1600 ISO. All in all, an excellent performance from a very accomplished camera." Digital Trends has a review of the Canon PowerShot A720 IS and writes, "For around $225 USD, this is a solid-yet-not-great camera. Christmas didn’t come early so you can’t expect a camera for this price to have the response and low-noise capability of a $1,000 D-SLR! If you can spare the extra money, I’d still go the SD870 IS but a hundred bucks is still 30 gallons of gas. The PowerShot A720 IS is a fine performer outdoors but has its faults in low light and it is a little pokey when you use the flash. It’s not a slam dunk winner but neither is it a dog—it’s a compromise. And compromises rarely make everyone jump for joy." Imaging Resource reviews the Canon PowerShot A720 IS and writes – "From the optical viewfinder to the manual modes to the variable power flash, whenever I looked for a feature a photographer would appreciate, I found it on the Canon A720 IS. There isn’t a gaudy LCD (with no room for a viewfinder) or extravagant zoom range (with big compromises in optical quality) or any of the frills (frames, in-camera presentations) of many less capable digicams. But if you want a mid-size digicam with a fairly long zoom that can take pictures like a real camera, this is it"